The most well-known war photo was not taken during World War I and neither during the Second World War. As you have already guessed, we are thinking about Robert Capa’s The fallen soldier. It's notorious that many debates rose around the authenticity of this image. This premise is important to set the background of all possible discussions about the relationship between photography and war, moreover since our war imagery (and above all our World War I imagery) is still a photography-driven one. Also the images taken during the Great War present similar problems of authenticity or propaganda aims and sometimes it’s not so easy to separate the images taken “in real action” from the ones that were probably put up like a show due to the presence of a camera in the trenches or behind the front line. Look for example at the above image of an elephant and two soldiers. 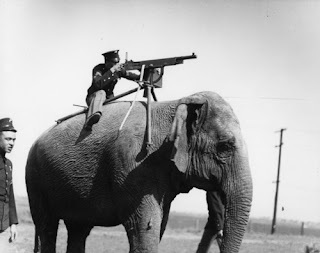 We know that elephants were used during the Great War but everything in this image makes us think about a kind of photomontage useful to prove the presence of such big animal in war operations and is probably just reproducing one of the uses of this animal (let’s say elephants like a “living machine-gun turrets”). We saw also images of camels used as provisional trenches and shelter. Of course we might be wrong about the above image, but look also to the electric pole on the background... These thoughts open a new chapter and namely the one of truthfulness of photography and its value as testimony, another intricacy that the historians already know very well.